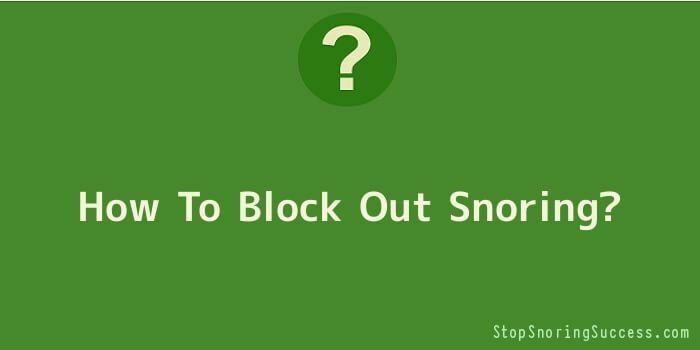 How To Block Out Snoring? Snoring is not really a serious sleeping disorder. However, it can really be a nuisance not only to the snorer’s roommates but also to the snorer himself. Snorers usually feel tired in the morning after a night’s rest because of their snoring at night. While snoring can really cause discomfort and nuisance to the snorer and his roommates, there are several ways that they can do to block out snoring. Snoring occurs when the air that flows through the mouth and nose is blocked and the sound is produced by the vibration of the throat’s wall when the snorer breathes. Obstruction of the air can be caused by several factors such as blocked nasal airways and long uvula. Snoring is usually common in overweight people and in men. In some cases, habitual snoring can pose some health risks on the snorer such as sleep apnoea, a serious sleeping disorder which if not treated, may result to the brain and body’s lack of oxygen supply. Sleep apnoea can cause discomfort to the person as it creates problems such as light sleeping, long breathing interruptions and poor sleep at night. If the snoring is due to the snorer’s being overweight, he or she can reduce snoring by having a healthy lifestyle and losing weight. Sleeping flat on the back is not advised as it may only add to the factors which cause snoring. External breathing aids such as a nasal breathing strip will also be of help to block out snoring. Airways are kept more open by the nasal breathing strip which also helps to block out snoring. Other devices that the snorer may use are chin cushions will helps to keep the mouth closed and mandibular advancement device which supports the jaw. The snorer will just have to choose the device which they are comfortable and suits them. If you are disturbed by your partner’s snoring, you may want to buy a white noise sound device which produces relaxing sounds that will help you sleep and block out snoring. Fans will also be of help to divert your attention from your partner’s snoring. Noisy sounds or those which will divert your attention to the snoring of your roommate will be of help to have a good night’s sleep. Snoring which is persistent should be consulted to the doctor as it may have to do with a more serious problem such as sleep apnoea which causes short breathing interruptions. Such condition should be discussed with the doctor to avoid further health risk problems. Snoring earplugs will also be of help to block out snoring sound from your roommate. Snoring earplugs can range from different styles, from the simplest ones down to those which produce sound to help the person with a roommate snorer to gain sleep. However, make sure that the earplugs will not damage the ears when you are using them.